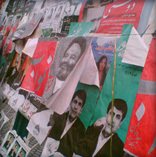 Prior to the elections, the Tehran streets awash with candidates' faces. "How did it feel to have voted then? ", I asked a friend as we left the small school tucked away from one of Tehran's main roads. "Like having done my duty, painful though it was", she responds. "Yes, it is like volunteering a gun to a person that will shoot you in the foot because the other one will go for your head – no different to how it was for me in England really", I add, inviting a nervous laughter between us. Like a song that's over reliant on its chorus we faded to silence and I'm certain she filled this moment with the same thoughts as I as we reflected on our recent political action. We'd gone against our family's aggressive protest as well as the tireless repetition of "what for?" and "why? spilling from the lips of our peers, had we wasted our time, or possibly made things worse? Having handed birth certificates, pressed our inked-sodden fingers and been issued voting slips we departed from the line of female civil-servants fully equipped to relinquish our fate. Two parallel walls hosted a huddle of people jotting down codes from the 10-large posters filled with details of an astounding 1200-plus candidates. Phone calls were made to confirm spelling as scraps of paper collected scribbles of hope. "Why are there 5-boxes available for the code and each of the candidates only have a 4-digit code? ", my friend gasped, far from reassured by the vague verbal instructions given by the onlooking security. We raced around shouting numbers to one another while collecting the 15-names needed to adorn the Tehran council. 1200 wasn't enough however, we were giving it up in style with the occasion offering further exercises of democracy – two extra ballots were available to embellish, a further 2-candidates were needed for something missed last time around and also 12 of the supreme league – not wanting to feel left out – were in need of some flattery. "No, if you vote for women only then the government will brag to the west about how this system not only functions but is inclusive and progressive"
Prior to the big day I'd planned various strategies for how I'd vote. "No, if the head in your drawing of a sheep falls between a box then they may count it a your choice", I was oddly informed. "No, if you vote for women only then the government will brag to the west about how this system not only functions but is inclusive and progressive", came more advice. "Pick the reformist candidates" I was repeatedly told, "but I want to vote for somebody I want, not for somebody who is opposes the person I don't want", I ranted, reminding myself of the strategic voting that distorts the political outcome back on the UK. "My statement cannot be lost with the unaware or unconcerned", I answered to the angry people that accusing me of giving credit to a system they've long given up on. "Apathy and conscious avoidance register the same with the absence of a 'none-of-the-above' box", I plead. "Increasing the turnout must surely represent an active public and an active public should invite a more conscientious government, spoiling your ballot is surely an available option", I conclude. It nearly seemed like a worthwhile option until I heard, "20,000 Basij have been brought into Tehran to vote!". Of course, I hadn't noticed, I was not registered to vote at any specific location, I'd freely walked into a school, handed my birth certificate and began my art project. And of course, any other Iranian is at liberty to do so also, potentially giving Tehran a 150% turnout for example. Indeed, maybe the gun was never in my hand – maybe we had wasted our time. I'd left the school having endured a test, and to the question of democracy I'd indulged it with my answer of action. I sit and wait to see the results yet even though my answer may not be counted, the certainty that at least one person had to decipher my choice, for me at least, counts.